With its unique promise to revolutionize science, engineering, technology, and other fields, nanotechnology continues to profoundly impact associated materials, components, and systems, particularly those used in telecommunications. These developments are leading to easier convergence of related technologies, massive storage data, compact storage devices, and higher-performance computing. 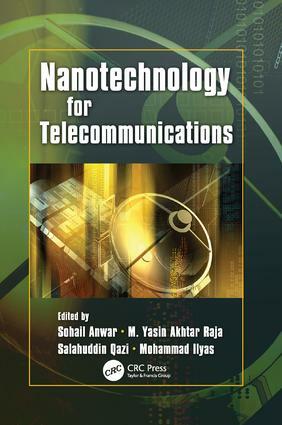 Nanotechnology for Telecommunications presents vital technical scientific information to help readers grasp issues and challenges associated with nanoscale telecommunication system development and commercialization—and then avail themselves of the many opportunities to be gleaned. The scale of the physical systems that use nanoscale electronic devices is still large, and that presents serious challenges to the establishment of interconnections between nanoscale devices and the outside world. Also addressing consequent social implications of nanotech, this book reviews a broad range of the nano concepts and their influence on every aspect of telecommunications. It describes the different levels of interconnections in systems and details the standardized assembly process for a broad specrum of micro-, nano-, bio-, fiber-optic, and optoelectronic components and functions. This book is a powerful tool for understanding how to harness the power of nanotech through integration of materials, processes, devices, and applications.